HEEEEEEE'S BAAAAAAACK!!!!!! Is he ever back? After missing his last start with a pulled groin, suffered in the 1st inning of his start against Orix two weeks ago, Daisuke Matsuzaka returned to the mound against the Nippon Ham Fighters. How would his gimpy mid-section respond to live pitching against a tough opponent. Pffffff....stupid. Why ask such a ridiculous question. 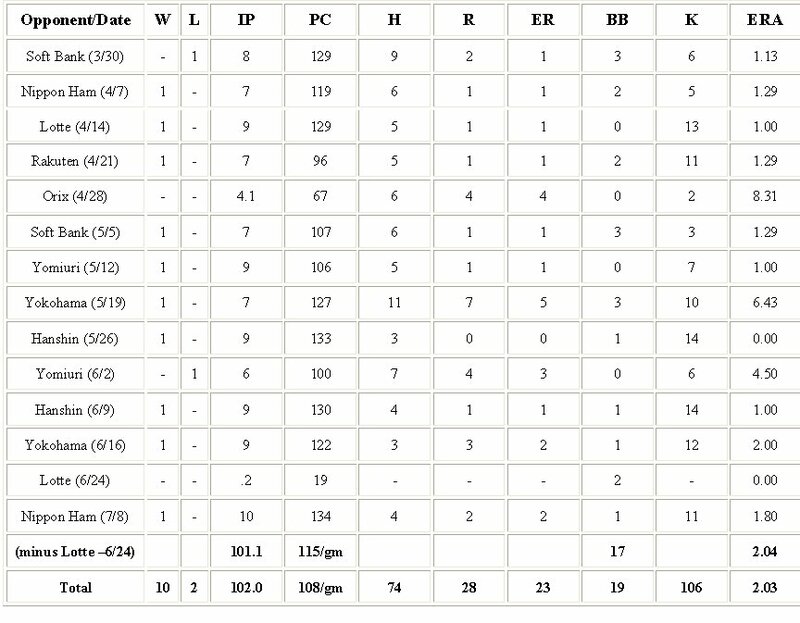 Try 10 innings of 4 hit, 2 run, ball. Yup, the Lions won 3-2 in dramatic walk off fashion and Matsuzaka pitched a 10 inning complete game on 134 pitches, striking out 11 for good measure. 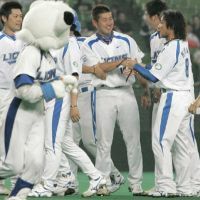 It was a good win, as Daisuke gave up a go ahead solo homer in the top of the 10th to right fielder Atsunori Inaba and needed his teammates help to steal the victory. That they did, as Seibu centerfielder Shogo Akada drove in the tying run in the home eighth, and then capped the win with an RBI single up the middle in the bottom of the tenth. Stylish. Nothing can stop the Matsuzaka Express. 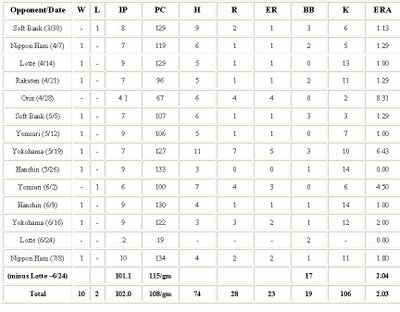 Click the image below for updated stats. One new addition is a brief line score above the season totals with adjustments excluding the .2 inning outing he had against Orix.